As of September 13, 2018, there were 992,192 shares of the Registrant’s common stock, par value $0.00001, issued and outstanding. Except for historical information, this Annual Report on Form 10-K (this “Annual Report”) contains forward-looking statements within the meaning of Section 27A of the Securities Act of 1933, as amended (the “Securities Act”) and Section 21E of the Securities Exchange Act of 1934, as amended (the “Exchange Act”). Such forward-looking statements include, among others, those statements including the words “believes”, “anticipates”, “expects”, “intends”, “estimates”, “plans” and words of similar import. Such forward-looking statements involve known and unknown risks, uncertainties and other factors that may cause our actual results, performance or achievements, or industry results, to be materially different from any future results, performance or achievements expressed or implied by such forward-looking statements. These risks and others described below under Item 1A. Risk Factors are not exhaustive. Given these uncertainties, readers of this Annual Report and investors are cautioned not to place undue reliance on such forward-looking statements. We disclaim any obligation to update any such factors or to publicly announce the result of any revisions to any of the forward-looking statements contained herein to reflect future events or developments. All references in this Annual Report to the “Company,” “HK eBus,” “we,” “us” or “our” are to HK eBus Corporation. We were incorporated in the State of Nevada on November 18, 2005, under the name Cobra Oil and Gas Company. We were formed to engage in identifying, investigating, exploring, and, where determined advantageous, developing, mining, refining, and marketing oil and gas. On October 14, 2009, we filed a Certificate of Amendment to our Articles of Incorporation to change our name to Viper Resources, Inc. and to increase our authorized capitalization from 200,000,000 shares, consisting of 100,000,000 shares of common stock, $0.00001 par value and 100,000,000 shares of preferred stock, $0.00001 par value to 400,000,000 shares, consisting of 300,000,000 shares of common stock $0.00001 par value and 100,000,000 shares of preferred stock, $0.00001 par value. Since inception, we were in the exploration stage as an oil and gas exploration company. In May 2012, our management determined to discontinue our oil and gas operations, and attempt to acquire other assets or business operations that will maximize shareholder value. During the fiscal year ended May 31, 2018, we engaged in no oil and gas activities, had minimal operations, and generated no revenues. On August 5, 2013, we filed a Certificate of Amendment to our Articles of Incorporation to effect a 1-for-100 reverse stock split of our common stock (the “Reverse Split”) and change our name to Rambo Medical Group, Inc. The Certificate of Amendment became effective on August 9, 2013. All share amounts referred in this Annual Report give effect to the Reverse Split including those applicable to periods prior to the Reverse Split. On August 31, 2015, we filed a Certificate of Amendment to our Articles of Incorporation to change our name to HK eBus Corporation and we changed our ticker symbol to “HKEB”. We intend to seek, investigate and, if such investigation warrants, engage in a business combination with a private entity whose business presents an opportunity for our shareholders. Our objectives discussed below are extremely general and are not intended to restrict our discretion. This discussion of the proposed business is not meant to be restrictive of our virtually unlimited discretion to search for and enter into potential business opportunities. We have no particular acquisition in mind and have not entered into any negotiations regarding such an acquisition and neither our officers nor any affiliate has engaged in any negotiations with any representative of any company regarding the possibility of an acquisition or merger between our company and such other company. We have not yet entered into any agreement, nor do we have any commitment or understanding to enter into or become engaged in a transaction. We will not restrict our potential candidate target companies to any specific business, industry or geographical location and, thus, may acquire any type of business. Further, we may acquire a venture which is in its preliminary or development stage, one which is already in operation, or in a more mature stage of its corporate existence. Accordingly, business opportunities may be available in many different industries and at various stages of development, all of which will make the task of comparative investigation and analysis of such business opportunities difficult and complex. a presence in the United States capital market. We have not conducted market research and are not aware of statistical data to support the perceived benefits of a merger or acquisition transaction for the owners of a business opportunity. a company seeking one or more of the other mentioned perceived benefits of becoming a public company. We anticipate seeking out a target business through solicitation. Such solicitation may include newspaper or magazine advertisements, mailings and other distributions to law firms, accounting firms, investment bankers, financial advisors and similar persons, the use of one or more websites and similar methods. No estimate can be made as to the number of persons who will be contacted or solicited. The analysis of new business opportunities will be undertaken by or under the supervision of our executive officers and directors, none of whom is a business analyst. Therefore, it is anticipated that outside consultants or advisors may be utilized to assist us in the search for and analysis of qualified target companies. A decision to participate in a specific business opportunity will be made based upon our analysis of the quality of the prospective business opportunity’s management and personnel, assets, the anticipated acceptability of products or marketing concepts, the merit of a proposed business plan, and numerous other factors which are difficult, if not impossible, to analyze using any objective criteria. We have unrestricted flexibility in seeking, analyzing and participating in potential business opportunities. In applying the foregoing criteria, no one of which will be controlling, management will attempt to analyze all factors and circumstances and make a determination based upon reasonable investigative measures and available data. Potentially available business opportunities may occur in many different industries, and at various stages of development, all of which will make the task of comparative investigation and analysis of such business opportunities extremely difficult and complex. Due to our limited capital available for investigation, we may not discover or adequately evaluate adverse facts about the opportunity to be acquired. In implementing a structure for a particular business acquisition, we may become a party to a merger, consolidation, reorganization, joint venture, or licensing agreement with another entity. We also may acquire stock or assets of an existing business. On the consummation of a transaction it is probable that the present management and shareholders of the company will no longer be in control of the company. In addition, our officers and directors, as part of the terms of the acquisition transaction, likely will be required to resign and be replaced by one or more new officers and directors without a vote of our shareholders. It is anticipated that any securities issued in any such reorganization would be issued in reliance upon exemption from registration under applicable federal and state securities laws. In some circumstances, however, as a negotiated element of a transaction, we may agree to register all or a part of such securities immediately after the transaction is consummated or at specified times thereafter. The issuance of substantial additional securities and their potential sale into any trading market which may develop in our securities may have a depressive effect on that market. While the actual terms of a transaction to which we may be a party cannot be predicted, it may be expected that the parties to the business transaction will find it desirable to avoid the creation of a taxable event and thereby structure the acquisition as a “tax-free” reorganization under Sections 351 or 368 of the Internal Revenue Code of 1986, as amended. With respect to any merger or acquisition, negotiations with target company management are expected to focus on the percentage of our company which the target company shareholders would acquire in exchange for all of their shareholdings in the target company. Depending upon, among other things, the target company’s assets and liabilities, our shareholders will in all likelihood hold a substantially lesser percentage ownership interest in our company following any merger or acquisition. The percentage ownership may be subject to significant reduction in the event we acquire a target company with substantial assets. Any merger or acquisition effected by us can be expected to have a significant dilutive effect on the percentage of shares held by our shareholders at such time. We will participate in a business opportunity only after the negotiation and execution of appropriate agreements. Although the terms of such agreements cannot be predicted, generally such agreements will require certain representations and warranties of the parties thereto, will specify certain events of default, will detail the terms of closing and the conditions which must be satisfied by the parties prior to and after such closing, will outline the manner of bearing costs, including costs associated with our attorneys and accountants, and will include miscellaneous other terms. We are presently subject to all of the reporting requirements included in the Exchange Act. Included in these requirements is our duty to file audited financial statements as part of our Form 8-K to be filed with the Securities and Exchange Commission (“SEC”) upon consummation of a merger or acquisition, as well as our audited financial statements included in its annual report on Form 10-K. 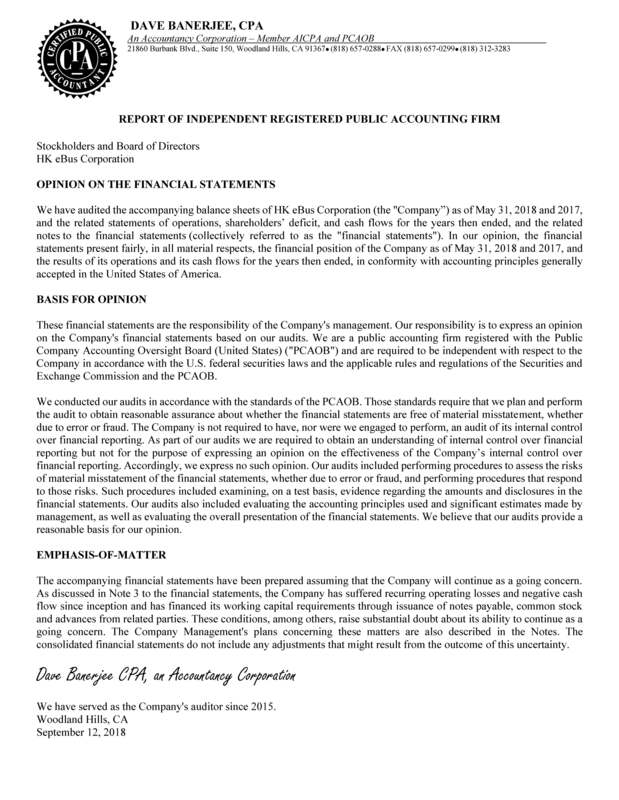 If such audited financial statements are not available at closing, or within time parameters necessary to insure our compliance with the requirements of the Exchange Act, or if the audited financial statements provided do not conform to the representations made by the target company, the closing documents may provide that the proposed transaction will be voidable at the discretion of our present management. It is anticipated that the investigation of specific business opportunities and the negotiation, drafting and execution of relevant agreements, disclosure documents and other instruments will require substantial management time and attention and substantial cost for accountants, attorneys and others. If a decision is made not to participate in a specific business opportunity, the costs theretofore incurred in the related investigation would not be recoverable. Furthermore, even if an agreement is reached for the participation in a specific business opportunity, the failure to consummate that transaction may result in our loss of the related costs incurred. Under SEC Rule 12b-2 under the Securities Act, we are deemed to be a “shell company,” because we have nominal assets (other than cash) and nominal operations. Management does not intend to undertake any efforts to cause a market to develop in our securities, either debt or equity, until we have successfully concluded a business combination. We intend to comply with the periodic reporting requirements of the Exchange Act for so long as we are subject to such requirements. We expect to encounter substantial competition in our efforts to acquire a business opportunity. The primary competition is from other companies organized and funded for similar purposes, small venture capital partnerships and corporations, small business investment companies and wealthy individuals. In view of our limited financial resources and limited management availability, we may be at a competitive disadvantage compared to our competitors. We presently have no employees apart from our management. Each of our officers is engaged in outside business activities and anticipates that he will devote to our business very limited time until the acquisition of a successful business opportunity has been identified. We expect no significant changes in the number of our employees other than such changes, if any, incident to a business combination. We intend to hire additional management and other support personnel when we have reached a point in our proposed growth that would allow for such employment. In the interim, we will rely upon consultants to assist us in identifying and investigating acquisition opportunities. We file annual, quarterly and current reports and other information with the SEC. Reports, statements and other information that we file with the SEC may be read and/or copied at the SEC’s public reference room at 100 F Street, N.E., Washington, D.C. 20549. Please call the SEC at (202) 551-8090 for further information on the public reference room. These SEC filings are also available to the public from commercial document retrieval services and at the Internet site maintained by the SEC at http://www.sec.gov. We currently do not have an Internet website. An investment in our common stock involves a high degree of risk. You should carefully consider the following risk factors before deciding to invest in our company. If any of the following risks actually occur, our business, financial condition, results of operations and prospects for growth would likely suffer. As a result, you may lose all or part of your investment in our company. We are a development stage company and may never be able to effectuate our business plan. Since inception, we were in the exploration stage as an oil and gas exploration company. In May 2012, our management determined to discontinue our oil and gas operations, and attempt to acquire other assets or business operations that will maximize shareholder value. We intend to seek, investigate and, if such investigation warrants, engage in a business combination with a private entity whose business presents an opportunity for our shareholders. As a development stage company we may not be able to successfully effectuate our business plan. There can be no assurance that we will ever achieve any revenues or profitability. The revenue and income potential of our proposed business and operations is unproven as the lack of operating history makes it difficult to evaluate the future prospects of our business. We require financing to acquire businesses and implement our business plan. We cannot be certain that we will be successful in obtaining financing or acquiring businesses, or in operating those acquired businesses in a profitable manner. We expect losses in the future because we have no revenue. As we have no current revenue, we are expecting losses over the next 12 months because we do not yet have any revenues to offset the expenses associated with our business plan. We cannot guarantee that we will ever be successful in generating revenues in the future. We recognize that if we are unable to generate revenues, we will not be able to earn profits or continue operations. There is no history upon which to base any assumption as to the likelihood that we will prove successful, and we can provide investors with no assurance that we will generate any operating revenues or ever achieve profitable operations. If our business plans are not successful, we may not be able to continue operations as a going concern and our stockholders may lose their entire investment in us. Since inception, we have had no revenues and incurred a cumulative net loss of $7,274,058 through May 31, 2018. This raises substantial doubt about our ability to continue as a going concern. We will, in all likelihood, sustain operating expenses without corresponding revenues, at least until the consummation of a business combination. This may result in our incurring a net operating loss that will increase continuously until we can consummate a business combination with a profitable business opportunity. We cannot be certain that we can identify a suitable business opportunity and consummate a business combination. If we cannot continue as a going concern, our stockholders may lose their entire investment in us. We do not have any definitive agreements for a business combination or other transaction. We have no present arrangement, agreement or understanding with respect to engaging in a merger with, joint venture with or acquisition of, any private or public entity. We cannot be certain that we will successfully identify and evaluate suitable business opportunities or that we will conclude a business combination. Management has not identified any particular industry or specific business within an industry for evaluation. We cannot guarantee that we will be able to negotiate a business combination on favorable terms, and there is consequently a risk that future funds allocated to the purchase of our shares will not be invested in a company with active business operations. The success of our proposed plan of operation will depend to a great extent on the operations, financial condition and management of any identified target company. While business combinations with entities having established operating histories are preferred, there can be no assurance that we will be successful in locating candidates meeting such criteria. The decision to enter into a business combination will likely be made without detailed feasibility studies, independent analysis, market surveys or similar information which, if we had more funds available to it, would be desirable. In the event we complete a business combination the success of our operations will be dependent upon management of the target company and numerous other factors beyond our control. We cannot be certain that we will identify a target company and consummate a business combination. While seeking a business combination, management anticipates devoting very limited time to our affairs in total. None of our officers has entered into a written employment agreement with us and is not expected to do so in the foreseeable future. This limited commitment may adversely impact our ability to identify and consummate a successful business combination. We are dependent on the services of our executive officers to obtain capital required to implement our business plan and for identifying, investigating, negotiating and integrating potential acquisition opportunities. The loss of services of senior management could have a substantial adverse effect on us. The expansion of our business will be largely contingent on our ability to attract and retain highly qualified corporate and operations level management team. We cannot be certain that we will find suitable management personnel or will have financial resources to attract or retain such people if found. Target companies that fail to comply with SEC reporting requirements may delay or preclude acquisition. Sections 13 and 15(d) of the Exchange Act require reporting companies to provide certain information about significant acquisitions, including audited financial statements for the company acquired. The time and additional costs that may be incurred by some target entities to prepare these statements may significantly delay or essentially preclude consummation of an acquisition. Otherwise suitable acquisition prospects that do not have or are unable to obtain the required audited statements may be inappropriate for acquisition so long as the reporting requirements of the Exchange Act are applicable. Although we are subject to the reporting requirements under the Exchange Act, management believes we will not be subject to regulation under the Investment Company Act of 1940, as amended (the “Investment Company Act”), since we will not be engaged in the business of investing or trading in securities. If we engage in business combinations which result in our holding passive investment interests in a number of entities, we could be subject to regulation under the Investment Company Act. If so, we would be required to register as an investment company and could be expected to incur significant registration and compliance costs. We have obtained no formal determination from the SEC as to our status under the Investment Company Act and, consequently, violation of the Investment Company Act could subject us to material adverse consequences. We may need to raise additional capital to expand our operations and execute our business plan. If our operations do not produce the necessary cash flow, or if we cannot obtain needed funds, we may be forced to reduce or cease our activities with consequent loss to investors. We have a need for cash in order to pay obligations currently due in a timely manner, and to finance our business operations. Our continued operations will depend upon the sustainability of cash flow from our ability to raise additional funds, as required, through equity or debt financing. There is no assurance that we will be able to obtain additional funding when it is needed, or that such funding, if available, will be obtainable on terms acceptable to us. If we cannot obtain needed funds, we may be forced to reduce or cease our activities with consequent loss to investors. In addition, should we incur significant presently unforeseen expenses or delays, we may not be able to accomplish our goals. If we fail to develop and maintain an effective system of internal controls, we may not be able to accurately report our financial results or prevent fraud, as a result, current and potential shareholders could lose confidence in our financial reports, which could harm our business and the trading price of our common stock. Effective internal controls are necessary for us to provide reliable financial reports and effectively prevent fraud. Section 404 of the Sarbanes-Oxley Act of 2002 requires us to evaluate and report on our internal controls over financial reporting and have our independent registered public accounting firm annually attest to our evaluation. We plan to prepare for compliance with Section 404 by strengthening, assessing and testing our system of internal controls to provide the basis for our report. The process of strengthening our internal controls and complying with Section 404 is expensive and time consuming, and requires significant management attention, especially given that we have not yet undertaken any efforts to comply with the requirements of Section 404. We cannot be certain that the measures we will undertake will ensure that we will maintain adequate controls over our financial processes and reporting in the future. Furthermore, if we are able to rapidly grow our business, the internal controls that we will need will become more complex, and significantly more resources will be required to ensure our internal controls remain effective. Failure to implement required controls, or difficulties encountered in their implementation, could harm our operating results or cause us to fail to meet our reporting obligations. If we or our auditors discover a material weakness in our internal controls, the disclosure of that fact, even if the weakness is quickly remedied, could diminish investors’ confidence in our financial statements and harm our stock price. In addition, non-compliance with Section 404 could subject us to a variety of administrative sanctions, including the suspension of trading, ineligibility for listing on the OTC Bulletin Board, one of the national securities exchanges, and the inability of registered broker-dealers to make a market in our common stock, which would further reduce our stock price. Our principal stockholders, officers and director own a controlling interest in our voting stock, which could result in decisions adverse to our general shareholders. Our officers beneficially own in the aggregate approximately 50.4% of our outstanding common stock. As a result, our management will have the ability to control substantially all matters submitted to our stockholders for approval including: (a) election of our Board of Directors (the “Board”); (b) removal of any of our directors; (c) amendments of our Certificate of Incorporation or bylaws; (d) adoption of measures that could delay or prevent a change in control or impede a merger, takeover or other business combination involving us, or (e) other significant corporate transactions. Our failure to adopt certain corporate governance procedures may prevent us from obtaining a listing on a national securities exchange. We have only one director, and he is not “independent” as that term is defined in the rules of any national securities exchange. As a result, we do not have an Audit or Compensation Committee. The functions of those committees are conducted by the Board. Consequently, there is a potential conflict of interest in Board decisions that may adversely affect our ability of our common stock to be listed on a national securities exchange and, as a result, may adversely affect the liquidity of our common stock. Trading in our shares of common stock is limited, and will not improve unless we increase our sales, become profitable and secure more active market makers. There is a limited trading market for our common stock. There can be no assurance that a regular trading market for our securities will continue to develop or that it will be sustained. The trading price of our securities could be subject to wide fluctuations, in response to quarterly variations in our operating results, announcements by us or others, developments affecting us, and other events or factors. In addition, the stock market has experienced extreme price and volume fluctuations in recent years. These fluctuations have had a substantial effect on the market prices for many companies, often unrelated to the operating performance of such companies, and may adversely affect the market prices of the securities Such risks could have an adverse effect on the stock’s future liquidity. We may, in the future, issue additional common shares, which would reduce investors’ percent of ownership and may dilute our share value. Our Certificate of Incorporation, as amended, authorizes the issuance of 400,000,000 shares, consisting of 300,000,000 shares of common stock, $0.00001 par value per share, and 100,000,000 shares of preferred stock, $0.00001 par value per share. The future issuance of stock, including shares that may be issued upon conversion of shares of preferred stock, may result in substantial dilution in the percentage of our common stock held by our then existing shareholders. We may value any common stock issued in the future on an arbitrary basis. The issuance of common stock for future services or acquisitions or other corporate actions may have the effect of diluting the value of the shares held by our investors, and might have an adverse effect on any trading market for our common stock. Our Board of Directors is authorized to issue up to 100,000,000 shares of preferred stock with powers, rights and preferences designated by it which may be issued to create voting impediments or to frustrate persons seeking to effect a takeover or otherwise gain control of our company, thereby preventing investors from realizing a premium over the market value of their shares. Our Board is authorized to issue up to 100,000,000 shares of preferred stock with powers, rights and preferences designated by it. Shares of voting or convertible preferred stock could be issued, or rights to purchase such shares could be issued, to create voting impediments or to frustrate persons seeking to effect a takeover or otherwise gain control of our company. The ability of the Board to issue such additional shares of preferred stock, with rights and preferences it deems advisable, could discourage an attempt by a party to acquire control of our company by tender offer or other means. Such issuances could therefore deprive stockholders of benefits that could result from such an attempt, such as the realization of a premium over the market price for their shares in a tender offer or the temporary increase in market price that such an attempt could cause. Moreover, the issuance of such additional shares of preferred stock to persons friendly to the Board could make it more difficult to remove incumbent managers and directors from office even if such change were to be favorable to stockholders generally. Our common shares are subject to the “Penny Stock” Rules of the SEC and the trading market in our securities is limited, which makes transactions in our stock cumbersome and may reduce the value of an investment in our stock. The SEC has adopted Rule 15g-9 which establishes the definition of a “penny stock,” for the purposes relevant to us, as any equity security that has a market price of less than $5.00 per share or with an exercise price of less than $5.00 per share, subject to certain exceptions. For any transaction involving a penny stock, unless exempt, the rules require: (a) that a broker or dealer approve a person’s account for transactions in penny stocks; and (b) the broker or dealer receive from the investor a written agreement to the transaction, setting forth the identity and quantity of the penny stock to be purchased. In order to approve a person’s account for transactions in penny stocks, the broker or dealer must: (a) obtain financial information and investment experience objectives of the person; and (b) make a reasonable determination that the transactions in penny stocks are suitable for that person and the person has sufficient knowledge and experience in financial matters to be capable of evaluating the risks of transactions in penny stocks. The broker or dealer must also deliver, prior to any transaction in a penny stock, a disclosure schedule prescribed by the Commission relating to the penny stock market, which, in highlight form: (a) sets forth the basis on which the broker or dealer made the suitability determination; and (b) that the broker or dealer received a signed, written agreement from the investor prior to the transaction. Generally, brokers may be less willing to execute transactions in securities subject to the “penny stock” rules. This may make it more difficult for investors to dispose of our Common shares and cause a decline in the market value of our stock. Because we do not intend to pay any cash dividends on our common stock, our stockholders will not be able to receive a return on their shares unless they sell them. We intend to retain any future earnings to finance the development and expansion of our business. We do not anticipate paying any cash dividends on our common stock in the foreseeable future. Unless we pay dividends, our stockholders will not be able to receive a return on their shares unless they sell them. We cannot assure be certain that investors will be able to sell their shares when they desire to do so. Our executive offices are located at 800 East Colorado Boulevard, Suite 888, Pasadena, CA 91101 and cover an area of approximately 8,142 square feet. The use of these offices is supplied to us on a rent free basis by an affiliated party. From time to time we may be a defendant and plaintiff in various legal proceedings arising in the normal course of our business. We are currently not a party to any material legal proceedings or government actions, including any bankruptcy, receivership, or similar proceedings. In addition, we are not aware of any threatened litigation or action that could affect our operations. Furthermore, as of the date of this Annual Report, our management is not aware of any proceedings to which any of our directors, officers, or affiliates, or any associate of any such director, officer, affiliate, or security holder is a party adverse to our company or has a material interest adverse to us. As of September 15, 2015, our common stock was trading on the OTCQB of the OTC Markets Group Inc. under the symbol “HKEB” and, as of May 31, 2018, is trading on the OTC Pink. Our common stock was quoted on the OTC Bulletin Board of the OTC Markets Group Inc. under the symbol “CGCA.OB” from July 20, 2007 until November 6, 2009, from November 6, 2009 until August 9, 2013 under the symbol “VPRS.OB”, and from August 9, 2013 until September 14, 2015 under the symbol RMGI.PK. The following table sets forth the high and low bid prices for our common stock for the periods indicated as reported by the OTC Pink. The bid quotations reported by the OTC Pink reflect inter-dealer prices, without retail mark-up, mark-down or commission, and may not represent actual transactions. As of September 13, 2018, there were approximately 12 record holders of our common stock. We have never declared any cash dividends with respect to our common stock. Future payment of dividends is within the discretion of our Board of Directors and will depend on our earnings, capital requirements, financial condition and other relevant factors. Although there are no material restrictions limiting, or that are likely to limit, our ability to pay dividends on our common stock, we presently intend to retain future earnings, if any, for use in our business and have no present intention to pay cash dividends on our common stock. We have not sold any of our equity securities during the year ended May 31, 2018. at least one year has elapsed from the time that the issuer filed current Form 10 type information with the SEC reflecting its status as an entity that is not a shell company. As a result, our existing stockholders will not be able to sell the shares pursuant to Rule 144 without registration one year after we have completed our initial business combination assuming we meet the four conditions of a former shell company stated above at such time. We do not presently maintain any equity compensation plans and have not maintained any such plans since our inception. The following discussion should be read in conjunction with our audited consolidated financial statements and the accompanying notes included elsewhere in this Annual Report. The following discussion contains forward-looking statements that involve risks and uncertainties. Our actual results could differ materially from those anticipated in the forward-looking statements as a result of various factors, including those discussed elsewhere in this Annual Report. Historically, we were in the exploration stage as an oil and gas exploration company. In May 2012, our management determined to discontinue our oil and gas operations, and attempt to acquire other assets or business operations that will maximize shareholder value. During the fiscal year ended May 31, 2018, we engaged in no oil and gas activities, had minimal operations, and generated no revenues. No assurance can be given that we will successfully reach an agreement with any company and successfully complete and close an acquisition or business combination. No specific assets or businesses have been definitively identified and there is no certainty that any such assets or business will be identified or any transactions will be consummated. Our plan is to seek a business venture in which to participate. The selection of a business opportunity in which to participate is complex and extremely risky and will be made by management in the exercise of its business judgment. There is no assurance that we will be able to identify and acquire any business opportunity that will ultimately prove to be beneficial to us and our shareholders. We are pursuing our search for a business opportunity primarily through our officers and directors, although other sources, such as professional advisors, securities broker-dealers, venture capitalists, members of the financial community, and others, may present unsolicited proposals. Our activities are subject to several significant risks that arise primarily as a result of the fact that we have no specific business and may acquire or participate in a business opportunity based on the decision of management which will, in all probability, act without the consent, vote, or approval of our shareholders. A description of the manner in which we will pursue the search for and participation in a business venture is described above. We expect that we will need to raise funds in order to effectuate our business plans. We intend initially to seek additional investors to purchase our stock to provide us with working capital to fund our operations. Thereafter, we will seek to establish or acquire businesses or assets with additional funds raised either via the issuance of shares or debt. There can be no assurance that additional capital will be available to us. We may seek to raise the required capital by other means. We may have to issue debt or equity or enter into a strategic arrangement with a third party. We currently have no agreements, arrangements or understandings with any person to obtain funds through bank loans, lines of credit or any other sources. Since we have no such arrangements or plans currently in effect, our inability to raise funds will have a severe negative impact on our ability to remain a viable company. In pursuing the foregoing goals, we may seek to expand or change the composition of the Board or make changes to our current capital structure, including issuing additional shares or debt and adopting a stock option plan. We do not expect to generate any revenues over the next twelve months. Our principal business objective for the next 12 months will be to seek, investigate and, if such investigation warrants, engage in a business combination with a private entity whose business presents an opportunity for our shareholders. During the next 12 months we anticipate incurring costs related to filing of Exchange Act reports, and costs relating to consummating an acquisition. We believe we will be able to meet these costs through use of funds in our treasury and additional amounts, as necessary, to be loaned by or invested in us by our stockholders, management or other investors. We have no specific plans, understandings or agreements with respect to the raising of such funds, and we may seek to raise the required capital by the issuance of equity or debt securities or by other means. Since we have no such arrangements or plans currently in effect, our inability to raise funds for the consummation of an acquisition may have a severe negative impact on our ability to become a viable company. We estimate that the level of working capital needed for these general and administrative costs for the next twelve months will be approximately $150,000. However, this estimate is subject to change, depending on the number of transactions in which we ultimately become involved. In addition, funding will be required for follow-on development of working interest obligations of any successful exploration prospects. In its report dated September 12, 2018, our auditor, Dave Banerjee CPA, a Professional Accountancy Corporation, expressed an opinion that there is substantial doubt about our ability to continue as a going concern. Our financial statements do not include any adjustments that may result from the outcome of this uncertainty. We have generated no operating revenues since our inception. We had an accumulated deficit of $7,274,058 as of May 31, 2018. Our continuation as a going concern is dependent upon future events, including our ability to raise additional capital and to generate positive cash flows. Presently we have no employees except for our four executive officers consisting of Dianwen Ju, Jimmy Wang, Xiao Chen and Guofeng Xu. Changes in the number of employees during the next twelve months will be a function of the level of business activity. We intend to contract out certain technical and administrative functions on an as-needed basis in order to conduct our operating activities. Our management team will select and hire these contractors and manage and evaluate their work performance. We have had no revenues since our inception. We had operating expenses of $28,607 and $26,212 for the years ended May 31, 2018 and 2017, respectively. The decrease in operating expenses by 9.1% during the year ended May 31, 2018 was attributable to a decrease in general and administrative expenses. We incurred net losses for the years ended May 31, 2018 and 2017 of $28,607 and $26,212, respectively, representing a decrease by 9.1%. The decrease in net loss was directly attributable to a decrease in general and administrative expenses. At May 31, 2018 we had a working capital deficit of $44,845 compared to a working capital deficit of $96,238 at May 31, 2017. Current liabilities decreased from $104,849 to $51,545, or 50.9%, from May 31, 2017 to May 31, 2018. Current assets decreased from $8,611 at May 31, 2017 to $6,700 at May 31, 2018 due to a decrease in cash and cash equivalents. We will attempt to raise capital for our current operational needs through loans from related parties, debt financing, equity financing or a combination of financing options. However, there are no existing understandings, commitments or agreements for extension of outstanding notes or an infusion of capital, and there are no assurances to that effect. Moreover, our need for capital may change dramatically if and during that period, we acquire an interest in a business opportunity. There can be no assurances that any additional financings will be available to us on satisfactory terms and conditions, if at all. Unless we can obtain additional financing, our ability to continue as a going concern is doubtful. We consider all highly liquid investments with an original maturity of three months or less as cash equivalents. We account for income taxes under Accounting Standard Codification 740 (“ASC 740”). Under ASC 740 deferred taxes are provided on a liability method whereby deferred tax assets are recognized for deductible temporary differences and operating loss carryforwards and deferred tax liabilities are recognized for taxable temporary differences. Temporary differences are the differences between the reported amounts of assets and liabilities and their tax bases. Deferred tax assets are reduced by a valuation allowance when, in the opinion of management, it is more likely than not that some portion or all of the deferred tax assets will not be realized. Deferred tax assets and liabilities are adjusted for the effects of changes in tax laws and rates on the date of enactment. The net income (loss) per share is computed by dividing the net income (loss) by the weighted average number of shares of common outstanding. Warrants, stock options, and common stock issuable upon the conversion of our preferred stock (if any), are not included in the computation if the effect would be anti-dilutive and would increase the earnings or decrease loss per share. Revenue is recognized on an accrual basis as earned under contract terms. We have had no revenue to date. The carrying value of our financial instruments, including cash and cash equivalents, as reported in our balance sheet, approximates fair value. We account for employee and non-employee stock awards under ASC 718, whereby equity instruments issued to employees for services are recorded based on the fair value of the instrument issued and those issued to non-employees are recorded based on the fair value of the consideration received or the fair value of the equity instrument, whichever is more reliably measurable. Refer to Note 2 to the Financial Statements included in Item 8 of this Annual Report, which discusses the most recent accounting pronouncements we adopted. See the Financial Statements and notes thereto commencing on page F-1. We maintain disclosure controls and procedures that are designed to ensure that material information required to be disclosed in our periodic reports filed under the Exchange Act is recorded, processed, summarized, and reported within the time periods specified in the SEC’s rules and forms and to ensure that such information is accumulated and communicated to our management, including our chief executive officer and chief financial officer, as appropriate, to allow timely decisions regarding required disclosure. During the fiscal year ended May 31, 2018, we carried out an evaluation, under the supervision and with the participation of our management, including our principal executive officer and our principal financial officer, of the effectiveness of the design and operation of our disclosure controls and procedures, as defined in Rules 13(a)-15(e) and 15d-15(e) under the 1934 Act. Based on this evaluation, management concluded that, as of May 31, 2018, our disclosure controls and procedures were effective. Our management is responsible for establishing and maintaining adequate internal control over financial reporting. Our internal control over financial reporting is a process designed to provide reasonable assurance regarding the reliability of financial reporting and the preparation of financial statements for external reporting purposes in accordance with U.S. generally accepted accounting principles. Our internal control over financial reporting includes those policies and procedures that (i) pertain to the maintenance of records that, in reasonable detail, accurately and fairly reflect transactions and dispositions of assets; (ii) provide reasonable assurances that transactions are recorded as necessary to permit preparation of financial statements in accordance with U.S. generally accepted accounting principles, and that receipts and expenditures are being made only in accordance with authorizations of our management and directors; and (iii) provide reasonable assurance regarding prevention or timely detection of unauthorized acquisition, use or disposition of our assets that could have a material effect on our financial statements. Because of its inherent limitations, internal control over financial reporting may not prevent or detect misstatements. Management assessed the effectiveness of our internal control over financial reporting as of May 31, 2018 based on the framework established in Internal Control-Integrated Framework issued by the Committee of Sponsoring Organizations of the Treadway Commission (COSO). Based on that assessment, management concluded that, as of May 31, 2018, our internal control over financial reporting was effective based on the criteria established in Internal Control-Integrated Framework. Our management, including our Chief Executive Officer (principal executive officer) and Chief Financial Officer (principal financial officer), does not expect that our disclosure controls and procedures or our internal controls will prevent all errors and all fraud. A control system, no matter how well conceived and operated, can provide only reasonable, not absolute, assurance that the objectives of the control system are met. Our control systems are designed to provide such reasonable assurance of achieving their objectives. Further, the design of a control system must reflect the fact that there are resource constraints and the benefits of controls must be considered relative to their costs. Because of the inherent limitations in all control systems, no evaluation of controls can provide absolute assurance that all control issues and instances of fraud, if any, within our company have been detected. These inherent limitations include, but are not limited to, the realities that judgments in decision-making can be faulty and that breakdowns can occur because of simple error or mistake. Additionally, controls can be circumvented by the individual acts of some persons, by collusion of two or more people, or by management override of the control. The design of any system of controls also is based in part upon certain assumptions about the likelihood of future events and there can be no assurance that any design will succeed in achieving its stated goals under all potential future conditions. Over time, controls may become inadequate because of changes in conditions, or the degree of compliance with the policies or procedures may deteriorate. Because of the inherent limitations in a cost-effective control system, misstatements due to error or fraud may occur and not be detected. During the fiscal year ended May 31, 2018, there were no changes in our internal control over financial reporting that materially affected or are reasonably likely to materially affect our internal controls over financial reporting. Directors serve until the next annual meeting of the stockholders, until their successors are elected or appointed and qualified, or until their prior resignation or removal. Officers serve for such terms as determined by our Board. Each officer holds office until such officer’s successor is elected or appointed and qualified or until such officer’s earlier resignation or removal. No family relationships exist between any of our present directors and officers. The following is a brief account of the business experience during the past five years or more of each of our directors and executive officers. Dianwen Ju, Ph.D. has served as our President, Chief Executive Officer and sole Director since April 25, 2011. He received a Ph.D. degree in Immunology in 1999, a Master’s degree in Pharmacology in 1994, and a Bachelor’s degree in Pharmacy in 1991 in Second Military Medical University, Shanghai, China. He joined Shanghai MediPharm Biotech in 2002 as a director of R&D and he is currently CEO and Chairman of MediPharm Biotech Pharmaceuticals Co. Ltd (Bermuda). He is also a Research Professor in Fudan University, Shanghai, China. He has 20 years of R&D experiences in biological drugs and new therapies for the treatment of malignant cancer. He has more than 40 publications in peer-reviewed international journals including Journal of Clinical Oncology, Cancer Research, Gene Therapy, International Journal of Oncology, Cancer Gene Therapy, Cancer Immunology & Immunotherapy, et al. He has invented 15 biotechnologies of which 8 are patented and the remaining 7 are pending. Before joining MediPharm in 2002, Dr. Ju had been an assistant director and a senior scientist in Shanghai Brilliance Biotech Institute and a lecturer in Immunology in Second Military Medical University for 6 years. Mr. Ju brings to our Board a wealth of experience derived from his services in various businesses. He has demonstrated strong acumen and ability to exercise sound judgment and has a reputation for integrity, honesty and adherence to ethical standards. Jimmy Wang has served as our Treasurer since April 25, 2011. He is the Chief Financial Officer of American Compass, Inc., where he has served, initially as Chief Accounting Officer, since 2003. Prior to joining American Compass, Inc., he served as an accounting manager for Planned Parenthood of the Greater Miami Valley from 2000 to 2003. He has served as a Director for Nevada Gold Holdings, Inc. since January 25, 2011. He is a graduate of the City University of New York, where he majored in both Accounting & Information Systems and Economics. Xiao Chen has served as our Chief Financial Officer since April 25, 2011. He worked at Brilliance China Group from 1994 to 2001. From 2005 to 2008, he worked as director of finance at Shanghai Medipharm Co. Ltd. Since 2008, Mr. Chen has been working at Hybrid Kinetic Group Limited as vice general manager of investments in China. Mr. Chen holds a bachelor’s degree in investment management from Shanghai Finance University. 1 Effective August 1, 2018, Dianwen Ju, Xiao Chen and Guofeng Xu resigned from all positions held with the Company. Also effective August 1, 2018, Jimmy Wang was appointed (i) to serve as Chief Executive Officer and Chief Financial Officer of the Company and (ii) as the sole member of the Company’s Board of Directors, replacing Dianwen Ju. Guofeng Xu has served as our Secretary since November 21, 2011. He performed Ph.D. Research involving the identification of new metalloprotease genes at the University of Virginia in Charlottesville, Virginia from August 2004 until December 2011. From August 2001 until June 2004 he performed M.S. Research in Shanghai, China involving the anti-cancer drug Onconase. Mr. Xu received a Ph.D. in Cell Biology from the University of Virginia in 2011 and a B.D. in Biological Science and Technologies from Zhejiang University in Hangzhou China in 2001. Our directors do not receive any remuneration for acting as such. Our directors may however be reimbursed their expenses, if any, for attendance at meetings of the Board. Our Board may designate from among its members an executive committee and one or more other committees. No such committees presently exist, due to the fact that we presently have only one director. Accordingly, we do not have an audit committee or an audit committee financial expert. We are presently not required to have an audit committee financial expert and do not believe we otherwise need one at this time due to our limited business operations. Similarly we do not have a nominating committee or a committee performing similar functions. Our sole director, Dianwen Ju, serves the functions of an audit committee and a nominating committee. We have not implemented procedures by which our security holders may recommend board nominees to us but expect to do so in the future, when and if we engage in material business operations. We are a small, development stage company which has yet to achieve operating revenues. We believe that our present management structure is appropriate for a company of our size and state of development. Our Board is actively involved in our risk oversight function and collectively undertakes our risk oversight function. This review of our risk tolerances includes, but is not limited to, financial, legal and operational risks and other risks concerning our reputation and ethical standards. Given our size, we do not have a nominating committee or a diversity policy. Our Board monitors and assesses the need for and qualifications of additional directors. We may adopt a diversity policy in the future in connection with our anticipated growth. Section 16(a) of the Exchange Act, as amended, requires that our directors, executive officers and persons who own more than 10% of a class of our equity securities that are registered under the Exchange Act to file with the SEC initial reports of ownership and reports of changes of ownership of such registered securities. To our knowledge, based solely on a review of such materials as are required by the SEC, none of our officers, directors or beneficial holders of more than 10% of our issued and outstanding shares of common stock failed to timely file with the SEC any form or report required to be so filed pursuant to Section 16(a) of the Exchange Act, during the fiscal year ended May 31, 2018. In 2007, we adopted a Code of Ethics that applies to our principal executive officer, principal financial officer, principal accounting officer or controller, persons performing similar functions as well as to our directors and employees. A copy of our Code of Ethics will be provided to any person requesting same without charge. To request a copy of our Code of Ethics please make written request to our President c/o HK eBus Corporation at 800 East Colorado Boulevard, Suite 888, Pasadena, CA 91101. 2 Effective August 1, 2018, Dianwen Ju resigned as the sole board member and Jimmy Wang was appointed as the sole member of the Company’s Board of Directors. The following table sets forth, for the last two fiscal years, the compensation earned by or paid to (i) each individual who served as our principal executive officer during the last fiscal year, and (ii) our two most highly compensated executive officers, other than our principal executive officer, who were serving as our executive officers at the end of the last fiscal year. We refer to these individuals in the discussion below as our “named executive officers”. We have not issued any stock options or maintained any stock option or other incentive plans since our inception. We have no plans in place and have never maintained any plans that provide for the payment of retirement benefits or benefits that will be paid primarily following retirement including, but not limited to, tax qualified deferred benefit plans, supplemental executive retirement plans, tax-qualified deferred contribution plans and nonqualified deferred contribution plans. Similarly, we have no contracts, agreements, plans or arrangements, whether written or unwritten, that provide for payments to the named executive officers or any other persons following, or in connection with the resignation, retirement or other termination of a named executive officer, or a change in control of us or a change in a named executive officer’s responsibilities following a change in control. None of our current officers or directors has an employment agreement with us. 3 Effective August 1, 2018, Dianwen Ju, Xiao Chen and Guofeng Xu resigned from all positions held with the Company. Also effective August 1, 2018, Jimmy Wang was appointed (i) to serve as Chief Executive Officer and Chief Financial Officer of the Company and (ii) as the sole member of the Company’s Board of Directors, replacing Dianwen Ju. all of our directors and executive officers as a group. The percentages in the table have been calculated on the basis of treating as outstanding for a particular person, all shares of our common stock outstanding on such date and all shares of our common stock issuable to such holder in the event of exercise of outstanding options, warrants, rights or conversion privileges owned by such person at said date which are exercisable within 60 days of August 21, 2018. Except as otherwise indicated, the persons listed below have sole voting and investment power with respect to all shares of our common stock owned by them, except to the extent such power may be shared with a spouse. (1) As used herein, the term beneficial ownership with respect to a security is defined by Rule 13d-3 under the Securities Exchange Act of 1934 as consisting of sole or shared voting power (including the power to vote or direct the vote) and/or sole or shared investment power (including the power to dispose or direct the disposition of) with respect to the security through any contract, arrangement, understanding, relationship or otherwise, including a right to acquire such power(s) during the next 60 days. Unless otherwise noted, beneficial ownership consists of sole ownership, voting and investment rights. (2) There were 992,192 shares of common stock issued and outstanding on September 13, 2018. (3) Jimmy Wang is the direct beneficial owner of 50,000 shares and the indirect beneficial owner of 350,000 shares. Jimmy Wang is deemed to have voting and investment power over the shares beneficially owned by Chimerica Capital, LLC. Our sole present director is not “independent” as that term is defined by the National Association of Securities Dealers Automated Quotations (“NASDAQ”) as our director also serves as our President and Chief Executive Officer. (1) Audit fees consist of fees incurred for professional services rendered for the audit of consolidated financial statements, for reviews of our interim consolidated financial statements included in our quarterly reports on Form 10-Q and for services that are normally provided in connection with statutory or regulatory filings or engagements. Prior to our engagement of our independent auditor, such engagement was approved by our Board. The services provided under this engagement may include audit services, audit-related services, tax services and other services. Pre-approval is generally provided for up to one year and any pre-approval is detailed as to the particular service or category of services and is generally subject to a specific budget. Pursuant our requirements, the independent auditors and management are required to report to our board of directors at least quarterly regarding the extent of services provided by the independent auditors in accordance with this pre-approval, and the fees for the services performed to date. Our Board of directors may also pre-approve particular services on a case-by-case basis. All audit-related fees, tax fees and other fees incurred by us for the years ended May 31, 2018 and 2017 were approved by our Board. were made only as of the date of the applicable agreement or such other date or dates as may be specified in the agreement and are subject to more recent developments. Accordingly, these representations and warranties may not describe the actual state of affairs as of the date they were made or at any other time. Additional information about the Company may be found elsewhere in this Annual Report and our other public filings, which are available without charge through the SEC’s website at http://www.sec.gov. ** This certification is being furnished and shall not be deemed “filed” with the SEC for purposes of Section 18 of the Exchange Act, or otherwise subject to the liability of that section, and shall not be deemed to be incorporated by reference into any filing under the Securities Act or the Exchange Act, except to the extent that the registrant specifically incorporates it by reference. † Pursuant to Rule 406T of Regulation S-T, this XBRL related information shall not be deemed to be “filed” for purposes of Section 18 of the Exchange Act, or otherwise subject to the liability of that section, and shall not be deemed part of a registration statement, prospectus or other document filed under the Securities Act or the Exchange Act, except as shall be expressly set forth by specific reference in such filings. (1) Filed as an exhibit, numbered as indicated above, to Registrant’s Registration Statement on Form SB-2, as filed with the Securities and Exchange Commission on July 25, 2006, which exhibit is incorporated herein by reference. (2) Filed as an exhibit, numbered as indicated above, to Registrant’s Current Report on Form 8-K, dated October 14, 2009, as filed with the Securities and Exchange Commission on February 3, 2010, which exhibit is incorporated herein by reference. (3) Filed as an exhibit, numbered as indicated above, to Registrant’s Current Report on Form 8-K dated August 12, 2009, as filed with the Securities and Exchange Commission on August 17, 2009, which exhibit is incorporated herein by reference. (4) Filed as an exhibit, numbered as indicated above, to Registrant’s Current Report on Form 8-K dated September 22, 2009, as filed with the Securities and Exchange Commission on September 25, 2009, which exhibit is incorporated herein by reference. (5) Filed as an exhibit, numbered as indicated above, to Registrant’s Quarterly Report on Form 10-QSB for the quarter ended August 31, 2007, as filed with the Securities and Exchange Commission on October 15, 2007, which exhibit is incorporated herein by reference. (6) Filed as an exhibit, numbered as indicated above, to Registrant’s Current Report on Form 8-K dated May 22, 2008, as filed with the Securities and Exchange Commission on May 27, 2008, which exhibit is incorporated herein by reference. (7) Filed as an exhibit, numbered as indicated above, to Registrant’s Current Report on Form 8-K dated June 10, 2008, as filed with the Securities and Exchange Commission on July 2, 2008, which exhibit is incorporated herein by reference. (8) Filed as an exhibit, numbered as indicated above, to Registrant’s Annual Report on Form 10-KSB for the year ended May 31, 2007, as filed with the Securities and Exchange Commission on August 28, 2007, which exhibit is incorporated herein by reference. (9) Filed as an exhibit, numbered as indicated above, to Registrant’s Current Report on Form 8-K dated July 6, 2009, as filed with the Securities and Exchange Commission on July 14, 2009, which exhibit is incorporated herein by reference. (10) Filed as an exhibit, numbered as indicated above, to Registrant’s Current Report on Form 8-K dated July 25, 2009, as filed with the Securities and Exchange Commission on July 30, 2009, which exhibit is incorporated herein by reference. (11) Filed as an exhibit, numbered as indicated above, to Registrant’s Current Report on Form 8-K dated August 5, 2009, as filed with the Securities and Exchange Commission on August 11, 2009, which exhibit is incorporated herein by reference. (12) Filed as an exhibit, numbered as indicated above, to Registrant’s Current Report on Form 8-K dated August 12, 2009, as filed with the Securities and Exchange Commission on August 17, 2009, which exhibit is incorporated herein by reference. (13) Filed as an exhibit, numbered as indicated above, to Registrant’s Annual Report on Form 10-K for the year ended May 31, 2009, as filed with the Securities and Exchange Commission on August 20, 2009, which exhibit is incorporated herein by reference. (14) Filed as an exhibit, numbered as indicated above, to Registrant’s Quarterly Report on Form 10-Q for the quarter ended August 31, 2009, which exhibit is incorporated herein by reference. (15) Filed as an exhibit, numbered as indicated above, to Registrant’s Current Report on Form 8-K dated August 5, 2013, as filed with the Securities and Exchange Commission on August 8, 2013, which exhibit is incorporated herein by reference. (16) Filed as an exhibit, numbered as indicated above, to Registrant’s Current Report on Form 8-K dated June 5, 2015, as filed with the Securities and Exchange Commission on June 11, 2015, which exhibit is incorporated herein by reference. (17) Filed as an exhibit, numbered as indicated above, to Registrant’s Annual Report on Form 10-K for the year ended May 31, 2015, as filed with the Securities and Exchange Commission on September 15, 2015, which exhibit is incorporated herein by reference. Pursuant to the requirements of the Exchange Act this report has been signed below by the following persons on behalf of the Registrant and in the capacities indicated on this 13th day of September, 2018. HK eBus Corporation, formerly known as Rambo Medical Group, Inc., was incorporated in the State of Nevada on November 18, 2005. On October 14, 2009, the Company filed a Certificate of Amendment to its Articles of Incorporation to increase its shares of authorized common stock from 100,000,000 to 300,000,000 and to change its name from Cobra Oil and Gas Company to Viper Resources, Inc. The Company was formed to engage in identifying, investigating, exploring, and where determined advantageous, developing, mining, refining, and marketing oil and gas. The Company may also engage in any other business permitted by law, as designated by the Board of Directors of the Company. On April 25, 2011, the Company’s previous management was replaced in its entirety. In May 2012, the Company’s management determined to discontinue its oil and gas operations, and attempt to acquire other assets or business operations that will maximize shareholder value. On August 31, 2015, the Company changed its name to HK EBUS Corporation and changed its ticker symbol to HKEB. Our financial statements are prepared in accordance with accounting principles generally accepted in the United States of America (“GAAP”). The preparation of our financial statements requires us to make estimates and assumptions that affect, among other areas, the reported amounts of trade receivable reserves and inventory reserves, impairment of long-lived assets, and recoverability of deferred tax assets. These estimates and assumptions also impact revenues, expenses and the disclosures in our financial statements and accompanying notes. Although these estimates are based on our knowledge of current events and actions we may undertake in the future, actual results may ultimately differ from these estimates and assumptions. The Company is currently in the development stage and has no significant operations. On August 9, 2013, the Company effected a 1-for-100 reverse split of the outstanding common stock. The accompanying financial statements and notes to the financial statements give retroactive effect to the reverse stock split for all periods presented. In January 2010, the FASB ASC Topic 825, Financial Instruments, began requiring disclosures about fair value of financial instruments in quarterly reports as well as in annual reports. For the Company, this statement applies to certain investments and long-term debt. Also, FASB ASC Topic 820, Fair Value Measurements and Disclosures, clarifies the definition of fair value for financial reporting, establishes a framework for measuring fair value and requires additional disclosures about the use of fair value measurements. Level 1 - Valuations based on quoted prices in active markets for identical assets or liabilities that an entity has the ability to access. Level 2 - Valuations based on quoted prices for similar assets and liabilities in active markets, quoted prices for identical assets and liabilities in markets that are not active, or other inputs that are observable or can be corroborated by observable data for substantially the full term of the assets or liabilities. Level 3 - Valuations based on inputs that are supportable by little or no market activity and that are significant to the fair value of the asset or liability. The Company had no financial instruments to measure for fair value as of September 13, 2018. In May 2014, the FASB issued ASC Topic 606, Revenue from Contracts with Customers, which applies to all entities and all contracts with customers, with the exception of certain contracts (including leases, insurance contracts, and other contractual agreements and exchanges between entities in the same line of business), as noted in ASC 606-10. ASC 606 became effective for the Company this year, but the Company cannot assess the impact of ASC 606 because it has not yet generated revenues and is not currently tied to a specific line of business. The Company will be able to evaluate the impact of the new rule in the future, when revenue streams are known. The preparation of financial statements in conformity with U.S. generally accepted accounting principles requires management to make certain estimates and assumptions that affect the amounts reported in the financial statements and accompanying notes. The Company is subject to uncertainty of future events, economic, environmental and political factors and changes in the Company’s business environment; therefore, actual results could differ from these estimates. Accordingly, accounting estimates used in the preparation of the Company’s financial statements will change as new events occur and that more experience is acquired, as additional information is obtained and as the Company’s operating environment changes. Changes are made in estimates as circumstances warrant. Such changes in estimates and refinement of estimation methodologies are reflected in the statements. Cash and cash equivalents include short-term, highly liquid investments with maturities of less than three months when acquired. The Company had $6,700 and $8,611 in cash on May 31, 2018 and 2017, respectively. The Company had no cash equivalent on May 31, 2018 and 2017. Services and goods received from vendors and billed but not yet paid are recorded as accounts payable in periods when the services and goods were received. As of May 31, 2018, $7,686 was recorded as accounts payable. The balance of accounts payable was $7,686 and $990 as of May 31, 2018 and 2017, respectively. The Company accounts for income taxes under Accounting Standards Codified No. 740 (“ASC 740”). Under ASC 740 deferred taxes are provided on a liability method whereby deferred tax assets are recognized for deductible temporary differences and operating loss carryforwards and deferred tax liabilities are recognized for taxable temporary differences. Temporary differences are the differences between the reported amounts of assets and liabilities and their tax bases. Deferred tax assets are reduced by a valuation allowance when, in the opinion of management, it is more likely than not that some portion or all of the deferred tax assets will not be realized. Deferred tax assets and liabilities are adjusted for the effects of changes in tax laws and rates on the date of enactment. The net income (loss) per share is computed by dividing the net income (loss) by the weighted average number of shares of common outstanding. Warrants, stock options, and common stock issuable upon the conversion of the Company’s preferred stock (if any), are not included in the computation if the effect would be anti-dilutive and would increase the earnings or decrease loss per share. The Company computes net loss per share in accordance with ASC 260, Accounting for Earnings per Share. Under the provisions of ASC 260, basic net loss per share is computed by dividing the net loss available to common stockholders for the period by the weighted average number of shares of common stock outstanding during the period. The calculation of diluted net loss per share gives effect to common stock equivalents; however, potential common shares are excluded if their effect is anti-dilutive. Basic net loss per common share is based on the weighted average number of shares of common stock outstanding since inception. As at each of May 31, 2018 and 2017, the Company had 992,192 shares of common stock outstanding, respectively. The computations of basic loss per share of common stock are based on the weighted average number of shares outstanding at the date of the financial statements. As of May 31, 2018, there were no common stock equivalents outstanding. In June 2014, the FASB issued ASU No. 2014-10, “Development Stage Entities (Topic 915), Elimination of Certain Financial Reporting Requirements, Including an Amendment to Variable Interest Entities Guidance in Topic 810, Consolidation”. The amendments in this update remove the definition of a development stage entity from Topic 915, thereby removing the distinction between development stage entities and other reporting entities from U.S. GAAP. In addition, the amendments eliminate the requirements for development stage entities to (1) present inception-to-date information on the statements of income, cash flows and shareholder’s equity, (2) label the financial statements as those of a development stage entity, (3) disclose a description of the development stage activities in which the entity is engaged, and (4) disclose in the first year in which the entity is no longer a development stage entity that in prior years it had been in the development stage. The Company’s early adoption of the new standard is not expected to have a material effect on the Company’s consolidated financial position or results of operations. Under the going concern assumption, an entity is ordinarily viewed as continuing in business for the foreseeable future with neither the intention nor the necessity of liquidation, ceasing trading, or seeking protection from creditors pursuant to laws or regulations. Accordingly, assets and liabilities are recorded on the basis that the entity will be able to realize its assets and discharge its liabilities in the normal course of business. The future of the Company is dependent upon its ability to obtain financing and upon future profitable operations from the development of its planned business. Management has plans to seek additional capital through a public or private offering of equity or debt securities, or by other means. These conditions raise substantial doubt about the Company’s ability to continue as a going concern. These financial statements do not include any adjustments that might arise from this uncertainty. There can be no assurance that sufficient funds required during the next year or thereafter will be generated from operations or that funds will be available from external sources such as debt or equity financings or other potential sources. The lack of additional capital resulting from the inability to generate cash flow from the operations or to raise capital from external sources would force the Company to substantially curtail or cease operations and would, therefore, have a material adverse effect on its business. Furthermore, there can be no assurance that any such required funds, if available, will be available on attractive terms or that they will not have a significant dilutive effect on the Company’s existing stockholders. The financial statements do not include any adjustments relating to the recoverability and classification of recorded assets, or the amounts of and classification of liabilities that might necessary in the event the Company cannot continue in existence. During 2013, ACI paid $28,859 in legal fees and $5,000 in auditing fees on behalf of the Company. As of November 30, 2013, ACI paid a total of $33,859 in legal and auditing fees on behalf of the Company due upon request. On May 16, 2013, the Company accepted another non-interest bearing and unsecured loan from ACI in the amount of $5,000, maturing on May 16, 2020. On November 4, 2013, the Company took another non-interest bearing and unsecured loan from ACI in the amount of $10,000, maturing on November 4, 2020. On April 17, 2014, the Company accepted another non-interest bearing and unsecured loan from ACI in the amount of $10,000, maturing on April 17, 2021. On June 30, 2014, the Company accepted another non-interest bearing and unsecured loan from ACI in the amount of $10,000, maturing on June 30, 2018. On November 19, 2014, the Company accepted another non-interest bearing and unsecured loan from ACI in the amount of $10,000, maturing on November 19, 2019. On February 4, 2015, June 24, 2015, September 30, 2015, October 21, 2015 and November 18, 2015, the Company accepted non-interest bearing and unsecured loans from ACI in the amounts of $10,000, $10,000, $10,000, $10,000, and $20,000, respectively, maturing on February 4, 2020, and June 24, 2020 September 30, 2020 October 21, 2020 and November 18, 2020, respectively. On January 23, 2017 and May 9, 2017, the Company accepted non-interest bearing and unsecured loans from ACI in the amounts of $10,000, and $10,000, respectively, maturing on January 23, 2020 and May 9, 2020, respectively. On January 12, 2018, the Company accepted a non-interest bearing and unsecured loan from ACI in the amount of $10,000, maturing on January 12, 2021. As of May 31, 2018, the total balance due to ACI is $228,859. The Company is authorized to issue 100,000,000 shares of preferred stock with a par value of $.00001. The Company is also authorized to issue 300,000,000 shares of common stock with a par value of $.00001. On May 6, 2008, the Company effected a 35-for-1 forward split of its outstanding shares of common stock. On July 20, 2010, the Company issued 50,000 shares of common stock to investors at a price of $2 per unit for a total of $100,000. The Company issued a total of 0.15 million shares of common stock to compensate its officers during the fiscal year of 2012. In order to seek alternative business development and future merging and stock offering, on August 8, 2013, the Company effected a 1-for-100 reverse stock split of the Company’s outstanding shares of common stock. There were 992,192 shares issued and outstanding at each of May 31, 2018 and May 31, 2017. As of May 31, 2008, the Company had 10,000 common stock purchase warrants outstanding, originally sold as part of a unit, allowing the holder to purchase one share of common stock at an exercise price of $40, anytime through May 15, 2011. In fiscal year 2009, the Company sold 10,000 units to an investor for cash at a price of $25 per unit for aggregate proceeds of $250,000. Each unit consists of one share of common stock and one warrant to purchase one share of common stock at an exercise price of $40, anytime through June 9, 2011. As of May 31, 2009, none of the warrants had been exercised, leaving a year-end balance of 20,000 warrants. The aggregate value of the units equal to $250,000 was assigned to the common stock as the warrants are non-detachable. In fiscal year 2010, the Company sold 20,252 units to investors for cash at prices ranging from $17 - $100 per unit, or an aggregate of $1,250,000. Each unit consists of one share of common stock, and one warrant to purchase one share of common stock at exercise prices ranging from of $20 - $125, anytime through expiration dates from June 2012 through February 2013. The entire value of the units was assigned to the common stock as the warrants are non-detachable. As of May 31, 2010, none of the warrants had been exercised or had expired, leaving a year-end balance of 40,252 warrants. During the year ended May 31, 2011, the Company sold 50,000 units to investors at a price of $2 per unit for an aggregate of $100,000. Each unit consists of one share of common stock, and one warrant to purchase one share of common stock at an exercise price of $2.50, anytime through expiration date of July 2013. The entire value of the units was assigned to the common stock as the warrants are non-detachable. As of May 31, 2011, none of the warrants had been exercised. During the fiscal year of 2011, 10,000 warrants expired, leaving a year-end balance of 80,252 warrants. During the year ended May 31, 2012, 10,000 warrants expired, leaving a year-end balance of 70,252 warrants. During the year ended May 31, 2013, 20,252 warrants expired, leaving a year-end balance of 50,000 warrants. During the year ended May 31, 2014, 50,000 warrants expired, leaving a year-end balance of 0 warrants. During the year ended May 31, 2018, there were no warrants outstanding. At May 31, 2018 and 2017, the Company had net operating loss carryforwards of approximately $7,274,058 and $7,245,451, respectively, which begin to expire in 2026. Deferred tax assets of approximately $2,836,883 and $2,825,726 in 2018 and 2017, respectively, created by the net operating losses have been offset by a 100% valuation allowance. The Company may be subjected to tax audit by the IRS for 2017 and 2018. The Company could become a party to various legal actions arising in the ordinary course of business. Matters that are probable of unfavorable outcomes to the Company and which can be reasonably estimated are accrued. Such accruals are based on information known about the matters, the Company’s estimates of the outcomes of such matters and its experience in contesting, litigating and settling similar matters. As of the date of this annual report, there are no material pending legal proceedings to which the Company is a party or of which any of their property is the subject, nor are there any such proceedings known to be contemplated by governmental authorities. Other than the board and director resignations and appointments described herein, the Company does not have any subsequent events to report as of September 13, 2018. Management has reviewed subsequent events through September 13, 2018, at which date Financial Statements were issued, and determined there were no other items to disclose.